A Valley dentist, who has an official anesthesia permit from the Arizona Dental Board, obtained the certification with a series of false, forged and fabricated documents, according to multiple people and organizations contacted by ABC15. A two-year anesthesia residency degree that medical school officials said is fake. Multiple documents and letters with signatures the alleged signees said are forged. A series of shifting and conflicting claims about where Goyal completed his anesthesia training. ABC15 also learned the Arizona Board of Dental Examiners executive director received multiple warnings in writing about Goyal’s credentials dating back years. But board officials refuse to provide information or documentation about what happened with those warnings and declined to answer questions about their vetting of Goyal. Experts said the danger of an untrained person putting patients under deep sedation and general anesthesia is significant. Dr. Pankaj Goyal was licensed to practice dentistry in Arizona in 2006. He currently runs a dental practice in Glendale called Arrowhead Smiles and Anesthesia. Before coming to Arizona, Goyal worked in Ohio, including a position as an Air Force dentist at the Wright Patterson Air Force Base, records show. ABC15 requested all public records related Goyal’s anesthesia credentials for the dental board. [Board officials did not provide any records related to any complaints or investigations, citing state confidentiality laws]. The records paint a confusing and conflicting picture of when and where he completed his anesthesia training and education. In 2013, Goyal filed an application with the dental board and obtained a 1301 General Anesthesia Permit, which is the highest level of anesthesia certification and authorizes holders to administer general anesthesia or deep sedation by any means. To obtain a 1301 permit, experts said a dentist would have to complete a full-time two- or three-year anesthesia residency program after dental school. As part of his 2013 application, Goyal wrote he completed a two-year dental anesthesia residency program at MetroHealth Medical Center in Cleveland from 1999 to 2001. As proof, he submitted two documents: (1) a “Certificate of Achievement” with MetroHealth’s logo and signed by the program’s director; (2) a letter on Air Force letterhead stating Goyal completed a residency at MetroHealth under military sponsorship. But MetroHealth officials said there’s no record of Pankaj Goyal completing any program. ABC15 also spoke with the man who allegedly signed the certificate, Dr. Frank Ditzig. After seeing a copy, he said that’s not his real signature. “The document is fraudulent, the signature is fraudulent,” Ditzig said. Sources also told ABC15 the signature on the Air Force letter is forged. The alleged signee, Dr. Mussaret Zuberi, declined to comment when reached by ABC15. But his first name on the letter is spelled wrong. MetroHealth officials also confirmed that certificate Goyal submitted is a fake. ABC15 obtained real MetroHealth certificates from multiple dentist anesthesiologists and those certificates look nothing like the one Goyal submitted to the dental board. ABC15 also discovered Goyal’s certificate has the same font, border and graphics as a basic Microsoft Word template . In 2014, Goyal submitted new and conflicting documents and information to the dental board about his anesthesia training. This time, he sent in a pair of new letters that stated he completed his anesthesia residency at the Medical Center on the Wright Patterson Air Force Base. The letters stated that Goyal completed the residency at the base from 1999 to 2001 – the same time he previously claimed to be at MetroHealth Medical Center. One of the letters was written by Dr. Jose Alvarez , who was a fellow dentist with Goyal in the Air Force. ABC15 spoke to Dr. Alvarez multiple times about the letter. Alvarez said Goyal asked him to write it but he doesn’t have any actual knowledge if the facts in it are true. In a subsequent email to ABC15, Alvarez recanted what he wrote. “I have found out that Dr. Goyal has mislead me regarding his anesthesia training for 20 years. I never received training alongside him, and took his remarks about his training and our discussions about his class work at face value. I apparently was deceived by him,” Alvarez wrote. An Air Force spokesperson also said they don’t have any records to support that Goyal completed any residency programs at any base. Dr. Goyal declined to answer any questions about his credentials on the phone and in person. When a reporter tried speaking to Goyal at his Glendale office, he would only answer by saying he wanted the reporter to leave. After dental board Executive Director Elaine Hugunin declined to answer specific questions about Goyal’s credentials, a reporter addressed the full dental board at its June meeting and revealed what ABC15 has discovered. The reporter also asked all board members to provide more information so the public can understand how Goyal was vetted and learn what happened to the multiple warnings sent to Hugunin. So far, no board members have provided ABC15 with any additional information. But at the end of the meeting, the board asked staff to look into what ABC15 uncovered. It was decided that if there were issues with Goyal’s credentials, they would discuss what to do about it at the next board meeting – two months later. As of July 6, 2018, Dr. Goyal’s 1301 anesthesia permit is still listed as active on the dental board’s website. 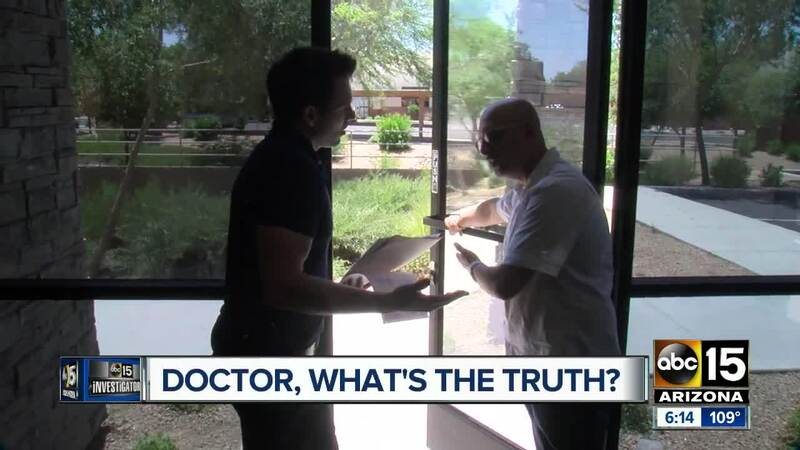 [Editor’s note: ABC15 Investigator Dave Biscobing has spent the past year investigating unlicensed health professionals. He’s working on a major project that will air / publish in the coming months. Anyone with information about an impostor health professional can contact him at dave@abc15.com.